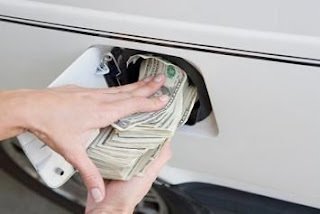 Home » Financial Tips » Saving » How Far Should You Drive to Save Money on Gas? How Far Should You Drive to Save Money on Gas? According to the Transportation Energy Data Book, the average miles-per-gallon for cars is 22.5 miles and the average for light trucks is 18.0 miles. Their light-truck category includes pickups, SUVs, minivans, vans and station wagons. The U.S. Department of Energy states that the least efficient two-seater is a Bugatti Veyron at 10 mpg and the most efficient subcompact is a Mitsubishi i-MiEV at 112+/- mpg. The IRS allows 55.5 cents per mile for business travel. This figure may not necessarily match an individual’s cost per mile. - maintenance - oil changes, tire rotation, etc. Be sure to include the depreciation of your vehicle. You can do this by going to Edmunds online and answering all the questions about your car. The “Private Party” figure is a good figure to use. If you do this at the first of each year, you will have what the vehicle is worth each year. Then take the value from the current year, subtract it from the value at the beginning of the previous year and this will give you the amount of depreciation you need to make the computation. You can use your own per-mile cost then to make a decision about how far to go out of your way to save on the tank of gas. According to Yahoo the size of a fuel tank averages about 16 gallons of gas. In other words, if you save 10 cents per gallon and are riding on empty, you can save $1.60. If you follow the government’s standard of 55.5 cents per mile, the dime saved when purchasing 16 gallons of gas will cover about 3 miles. Does that mean you should never go over 3 miles further to save 10 cents per gallon? Maybe. Sometimes you can go across state lines and save more if the taxes are less in the other state. Living in North Carolina and close to the South Carolina line, you can save 21 cents per gallon in taxes alone by filling up in South Carolina. A web site called “calculateme” states that “Only 1% of accidents occurred more than 50 miles from home.” Sixty-nine percent of accidents happen within 10 miles of home. Maybe the risk isn’t worth it. It certainly pays to go online and check out the local deals before you go for a fill. You can do this on GasBuddy.com. Checking this before starting out may mean you take a different route home without adding miles to the trip. Saving money in any possible can help to pay off your debt more quickly. There is some great advice here, especially if you are a transport company or courier firm or even a taxi driver for that matter. But it really put me in mind of my long departed father who was somewhat hardheaded and very set in his own way of thinking. It used to make me laugh every time as I was raised in the UK, and as you probably know fuel tax is something like 70%. So I commend him for having an eye to be frugal but I just could not get through to him how crazy what he was doing was, and in fact, was totally counterproductive. He would come home and very smugly say how he managed to fill the tank for ex amount of pounds where the price was once blah per gallon compared to the local petrol fuel station that was charging little more per gallon.